Remember the list I posted about a few days ago? Well, I can happily say I crossed two things off today. I finished the nursing cover for my sister-in-law. (I'll bring it by soon, LeighAnne.) And I finally finished Kade's curtains. This project has been in the works for a while. I made the curtains. Hung the curtains. 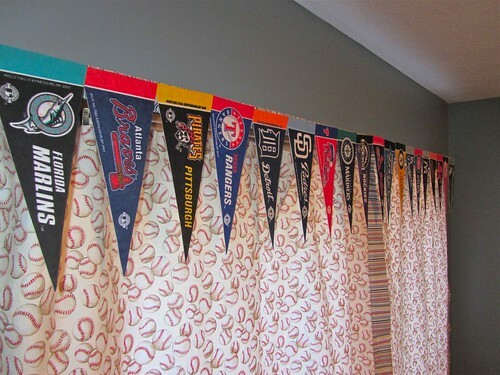 Made a "pennant" valance. (here's the before) Decided the curtains weren't wide enough. Tore the curtains apart. Thought the "pennants" looked like they belonged in a used car lot. Made a different valance. 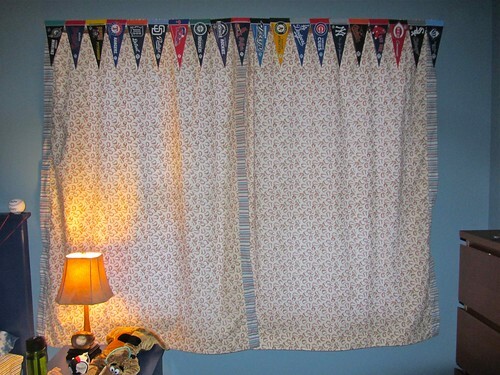 Added a strip of fabric to each side of the curtains. Then they hung there for a while because I didn't want to hem them. Hemming. I just don't like doing it, whether it's a skirt, curtains, or pants. I would much rather pick out a thousand stitches than hem something. Why do I think it's so hard? I don't know. I can usually get it done in no time when I make myself do it. So I made myself do it today. Here are the curtains. We ordered a set of official MLB mini pennants. They really add to Kade's baseball room. Most of them are on the valance but there a few hanging on his door and wall. What is something you don't like doing even though you know you can?